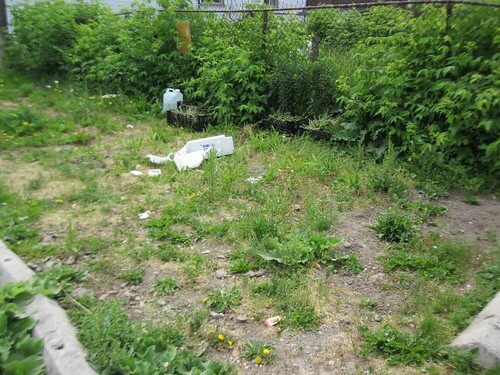 As mentioned in the previous post, once again this year I am the downtown coordinator for the Toronto Guerilla Gardeners, which means that I get to pick the spot in the downtown area that we will garden, and coordinate our efforts on the day of the plant. I did this last year as well, so I've had all year to plan our refresh of this garden. I borrowed a small rototiller from Byron, because I knew from last year that the ground is super hard and in need of work - last year we spent two long hours with shovels to prepare just a small zone. This year, with the help of the rototiller, we were able to prepare about half of the entire lot!! The soil sadly isn't very deep: about 4 inches down, there is a very hard gravel-based subsoil, which is best left as is. 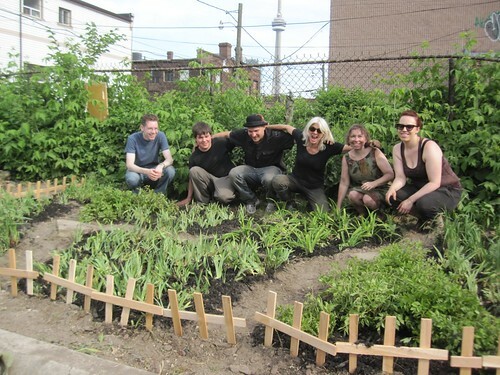 We added about 8 bags of soil (thank you Toronto Awesome Foundation, some of your money well spent! Also thanks to Terry and the Guerilla Gardening Mobile, for actually doing the leg work on that), plus we moved a 3 foot stretch of soil from the ungardened area into the gardened area. The combination of those those two got us a workable amount of soil over the whole prepared area. Which brings us to: donated plants! 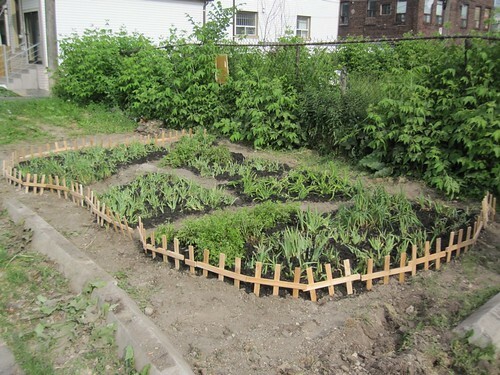 Thanks to a wonderful donation from now non-anonymous Sheridan Nurseries (thank you!) of as many Iris's and Astilbe's as we wanted (they had 1000+ of each), we got 13 big boxes of perennials. This is what allowed us to dream so big this year! Thanks to Linda's awesome direction and knowledge, we made a rivers and islands layout for the garden, which turned out so beautiful. Combined with the awesome black mulch, the garden looks incredible and alive. Thanks to everyone who came out, I for one had a fabulous time and I know that this kind of thing can't be done alone, it's best done with friends! Great job! Some determination, some hard and you guys really made a difference. I think they should implement an aesthetic friendly fence after the horticulture re-shaping of this project. Select conservatively the fence material that will be in harmony with the ammbiance of the place.